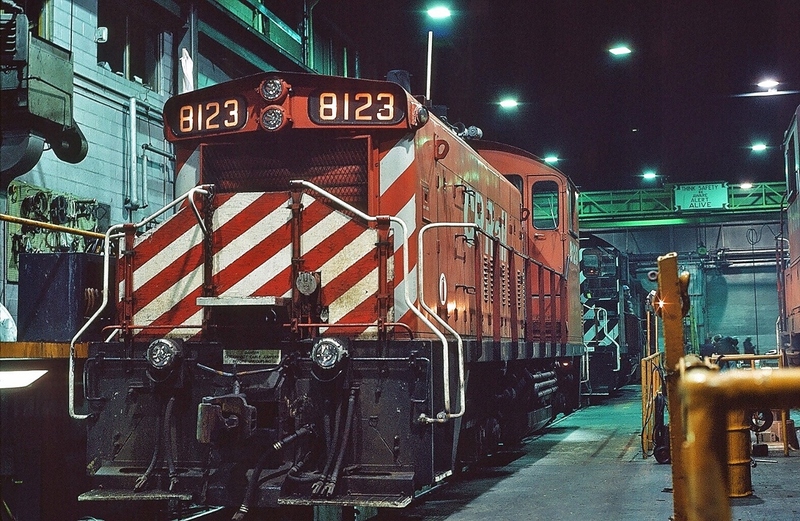 Railpictures.ca - sdfourty Photo: CP Rail #8123 inside the CP Rail Agincourt Diesel Shop. Kodachrome taken during an escorted (CP Rail permission granted) shop tour. #8123 is one of 72 GMD SW1200RS built 1958 – 1960 for the CPR; 33 SW1200RS units were rebuilt to SW1200RSu standards (replacing the 567 engine with a 645) in 1981 – 1985 however #8123 not in that program. #8123 sold to Helm Leasing April 1998. at the CP Rail Agincourt Diesel Shop December 15, 1984 Kodachrome by S. Danko what’s interesting ya gotta luv those candy stripes | Railpictures.ca – Canadian Railway Photography – photographie ferroviaire Canadienne. CP Rail #8123 inside the CP Rail Agincourt Diesel Shop. Kodachrome taken during an escorted (CP Rail permission granted) shop tour. 33 SW1200RS units were rebuilt to SW1200RSu standards (replacing the 567 engine with a 645) in 1981 – 1985 however #8123 not in that program. #8123 sold to Helm Leasing April 1998.